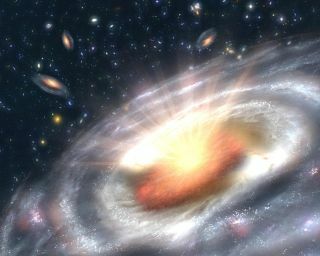 An artist's impression of a black hole like the one weighed in this work, sitting in the core of a disk galaxy. The black-hole in NGC4526 weighs 450,000,000 times more than our own Sun. NASA will reveal new findings about black holes during a news conference today (Feb. 27). The news conference, which starts at 1 p.m. EST (1800 GMT) Wednesday, will relay results based primarily on observations made by two X-ray space telescopes: NASA's Nuclear Spectroscopic Telescope Array (NuSTAR) and the European Space Agency’s XMM-Newton observatory, NASA officials said. Guido Risaliti, astronomer at the Harvard-Smithsonian Center for Astrophysics in Cambridge, Mass. NASA will stream audio of the teleconference, along with participants' visual aids, live at http://www.ustream.tv/nasajpl2. SPACE.com will carry the NASA feed here. The $165 million NuSTAR observatory launched in June 2012, kicking off a planned two-year mission to study the universe in high-energy X-ray light. The telescope's observations should help scientists better understand galaxy formation, black hole growth and other phenomena, mission team members have said. XMM-Newton is a grizzled space veteran by comparison. The telescope launched in December 1999 and has been probing X-ray emissions around the universe ever since.